For law enforcement officers around the world, partnering with animals is a time-honored tradition. Mounted police do their duty on horseback -- and, in some countries, camelback. Specially trained dogs serve and protect by sniffing out drugs and explosives. But in the Netherlands, police officers are inaugurating a new species of animal partner -- eagles -- to take down illegal aerial drones. In a statement released Jan. 31, the Dutch National Police Corps announced a new initiative using birds of prey to intercept unwanted drones. The program was developed and tested in partnership with Guard from Above (GFA), a Dutch company located in the Hague that specializes in training large, predatory birds to "hunt" and subdue robotic prey. 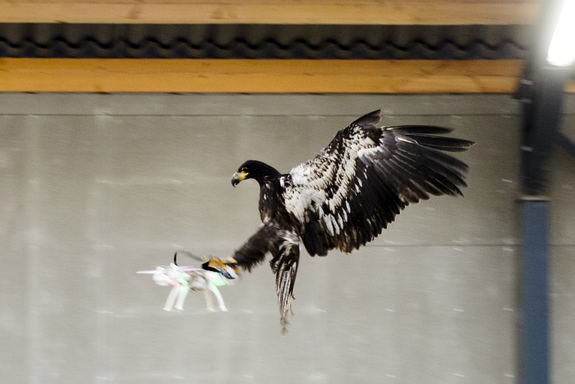 A video published by the National Police Corps of an indoor demonstration shows a handler releasing an eagle, which swoops toward a hovering quadcopter drone, snatching the machine out of the air and flying off with it into a corner of the training ring. According to Mark Wiebe, innovation manager of the National Unit of the police, the eagle reacts to the drone as it would to its normal prey -- not only grabbing it while in flight, but taking it immediately to ground, as it would any animal that it had just nabbed and was ready to eat. "For years, the government has been looking for ways to counter the undesirable use of drones," Sjoerd Hoogendoorn, GFA co-founder, said in a statement. "Sometimes a low-tech solution for a high-tech problem is more obvious than it seems. This is the case with our specially trained birds of prey. By using these birds' animal instincts, we can offer an effective solution to a new threat." The bird taking down the drone in the video appears to be a golden eagle, a powerful bird that typically preys on small mammals, but is capable of fighting off bears or coyotes when defending its prey or young, according to the Cornell Lab of Ornithology. In 2012, a viral video convinced many that a golden eagle had carried off a small child, though the video was later proven to be a hoax. Dutch police are currently investigating different approaches to contain rogue drones, which can interfere with helicopter flights, cause injury to bystanders, and even be used for criminal purposes, Wiebe said in the statement. Safety nets, which were tested by Tokyo police in December 2015, are also being considered. The police will make their final decision about making the eagles a permanent part of the squad after the test period concludes -- "in a few months," according to the statement.